The internal capital accounts are paper accounts; they do not have cash in them. They are an obligation – the company owes the money to each owner/employee when that person leaves the company. It is their equity – their share of the value of South Mountain Company. For years we stepped along merrily and carelessly – making dividend decisions, reading our accountants’ reports, enjoying the view, accumulating obligations, and thinking nothing of it. My tendency was to dismiss the question by saying: we have plenty of assets, we’re all young, we’re making good money, we can pay off our departing owners from revenues, it’s a long time away . . . But it wasn’t such a long time away and the obligation kept growing. In the mid-nineties we (finally) decided it would be prudent to start putting money away, to build a single-purpose equity investment fund to back up our obligation. At first we funded it episodically and irregularly. Mike Drezner, one of our early owners – a carpenter and a knowledgeable stock market maven/hobbyist – managed the fund with me and old friend Christina Platt, a socially responsible investment adviser at Morgan Stanley. Gradually, responsibility shifted from me to Michael, and for years Mike and Christina managed the fund together. In 2000 our obligation was $877,000 and the investment fund contained $72,000. It was time to get serious. We resolved to increase our contributions and build the fund until it contained – at all times – assets equal to at least 50% of our obligation. It had become clear to us that one of our primary responsibilities as owners was to honor our equity obligations for decades to come. By the end of 2004 we had reached our goal: there was $1,050,000 in equity obligations and $550,000 in the fund. Christina retired and her colleague Lisa Haner replaced her. Mike began to approach retirement age and trained Siobhan Mullin, our financial manager, to take over. 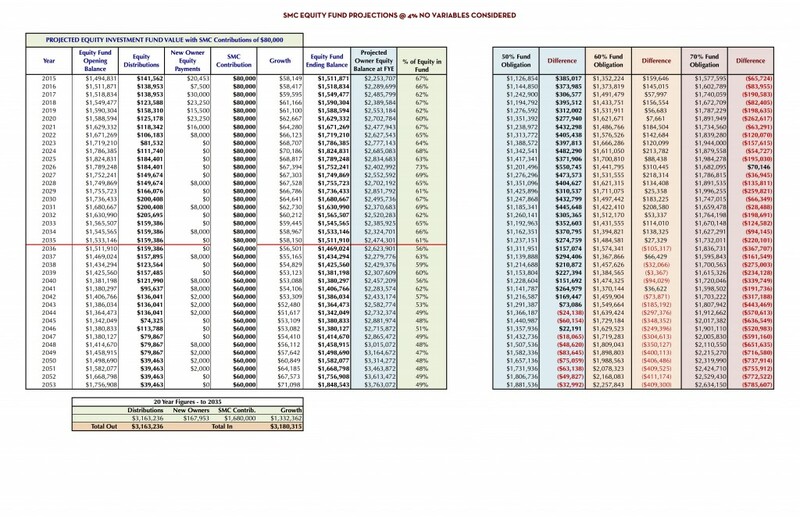 In 2012 Siobhan and Mike developed a 25 year spreadsheet that made a series of assumptions and projections about retirement dates, fund contributions, and fund earnings to help us determine how aggressively we need to build the fund over time. It’s like social security – it’s essential that we have the right amount of money to satisfy long-term obligations. Because this pot of money has a sole purpose (paying off departed owners) it’s important not to over-fund it, because that ties up cash needlessly and makes it unavailable for other important uses. But if there’s too little, we may not be able to meet our obligations in future years. This is the central tension of the equity fund. We examine the spreadsheet each year, adjust the variables, and look for patterns to help us decide about funding, which we include in each annual SMCo budget. Here is what the spreadsheet looks like (don’t try to read this; it’s just to illustrate!). Our equity fund has been skillfully managed. From the start, Mike has been a model steward and our advisers have been stellar. Although we took a hit in the crash of 2008, we rebounded well. The management transition from Mike to Siobhan has been seamless and successful. One of the most compelling aspects of the fund is the balance between safe investing and values investing. We seek investments that are truly consistent with our mission and values. We have invested small sums in Boston Community Capital (a superb organization that provides a wide range of debt and equity products for low income communities, affordable housing, and emerging businesses), Real Pickles, and Equal Exchange (Massachusetts worker co-ops like us – our investments help to fund their capital needs). We are always looking for low-risk mission-aligned investment opportunities, but in my view we are not yet looking hard enough. We need to divert a larger portion of our assets from stocks and bonds to true values-based (and preferably local) investments. They are, of course, hard to find, but investing in our local economy and like-minded businesses is a tremendous opportunity to put our money where our mouth is. The rubber met the road for the fund in the sobering times of post-crash 2009 as we reckoned with our future. Should we use our equity funds to help pay wages in the event of a work shortage? No, we decided, we would not, but we might use them for an investment that created work for our staff and had a reasonable chance of a successful return. 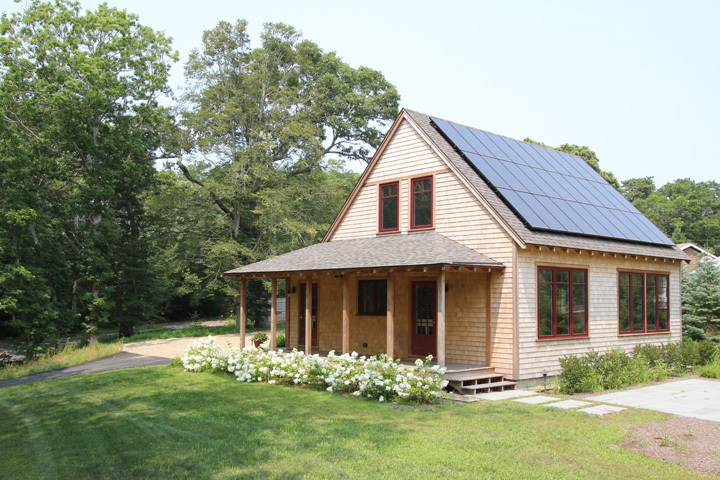 Ultimately, to create work, we invested $125,000 from the fund in a property on which we built a zero energy house on speculation. The project generated additional work, the house was sold, and the fund was paid back with a healthy chunk of interest from the proceeds. It was risky but turned out well. The big issues have been individual owners’ access to their funds pre-retirement (at this point we allow none except after age 62), whether to pay interest (we don’t), what are appropriate uses for the funds (only those which will definitely bring a return on investment), and what percentage of the obligation should we maintain in cash and assets at all times (current intelligence is 60%, but we review this regularly). This is our 40th year in business. Many employee/owners have been here since the early years. They are approaching retirement age; some have retired already. Others have left along the way for various reasons. Right now we are paying out seven prior owners who have departed over the years, including Mike, to whom we will be forever grateful. Currently the fund has future obligations of $2,610,000 and assets of $1,497,000 (57% assets to obligations). SMCo also has a pension fund that most employees are part of. Individuals contribute and the company matches with 2% of wages. This fund currently has assets of approximately $4,000,000. This is also managed by Lisa and Siobhan, but it’s easier to manage because the amount of money in the pension fund equals the obligation – always has and always will. The detailed history of the SMCo equity fund is available on request. Meanwhile, each of our owners continues to earn equity every day we work. Wages, benefits, profit sharing, and equity – all contribute to our earnings as SMCo owners. John, Fantastic piece! We are in the midst of discussions here at RP about how to approach and plan for retained patronage into the future… and this is super helpful! Thanks for taking the time to document your thoughts and experience. What a great testament to the power of collaboration and shared ownership. Congratulations on your vision becoming a reality. Do you know of any other worker cooperatives with this type of equity fund? Thanks to each of you for the comments. Just so’s you know, RP stands for Real Pickles, a wonderful (and mouth-watering) company in Greenfield MA that makes a variety of pickled products. Real Pickles converted to a worker co-op two years ago. Stephen – you asked about co-ops with this type of equity fund. I don’t know of others; I would like to. I’ll make a few inquiries and let you know if i hear of any. Blake – What EE, RP, OV, and Namaste have done in recent years with patient capital is a huge step forward. I continue to be impressed by the innovative ways people are developing to raise capital and the successes. Your thoughtful process and narrative about the SMCo equity fund and managing capital accounts at a ‘maturing’ South Mountain Company is great. You continue to adjust and even re-invent yourselves as an innovative enterprise and a model for others. As a participant in SMCo’s 1985 re-invention, it warms my heart to see this continuing commitment to excellence, deep values, and constructive change. Thanks Peter. You downplay your role. You more than “participated” in our conversion nearly 30 years ago. You were our guide, our architect, and our legal guru!! Note: in 1985 Peter was a lawyer with the Industrial Cooperatives Association (now the ICA Group – – ica-group.org/) and helped with our transition. He just stepped down from his longtime position as dean of the Univ of Maine School of Law, and remains a professor there.